Twenties And Fabulous by Kristen Berk: Color Me Yellow! But recently my luck must have changed because when I stepped into the mall it was bright yellow/neon galore! 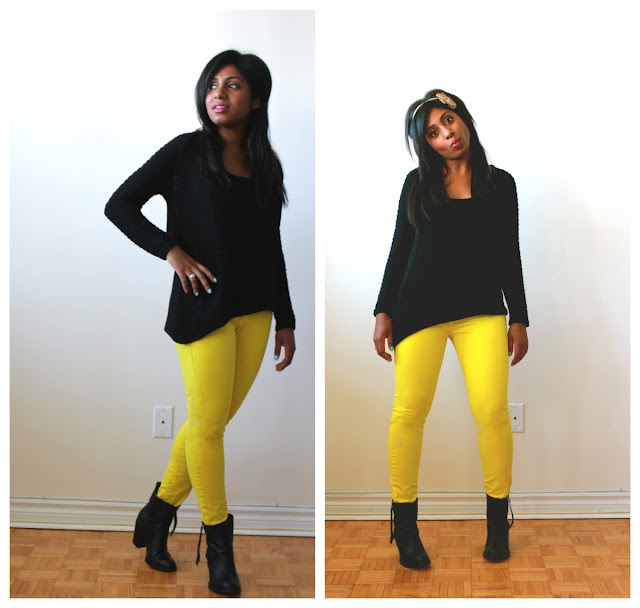 In fact, in the first store (ZARA) I stepped into I found these lovely yellow pants on sale for $39.99 from $69.99. At first I struggled to find my size because the store was in disarray due to the major sale that was going on. As I continued to make my way towards the cash desk, I found the right size of my pants stashed between some random items...beckoning for my attention. Oh it was definitely luck on my side! So overall my shopping adventure was a success! I am so happy with my new yellow jeans and the amazing deal that I got! Stay tuned because there will be more to come. Feel free to leave a comment and subscribe!